It’s time to talk about weird game shows again! A while ago, I wrote about Whew!, an unpronouncably-titled overly-complex game with Hanna-Barbera designed characters. This time, it’s the unaired Alex Trebek pilot, Malcolm, a semi-collaborative puzzle game with a twist. Trebek’s co-host is Malcolm, an animated video puppet. The game at the center of Malcolm is a little unusual. 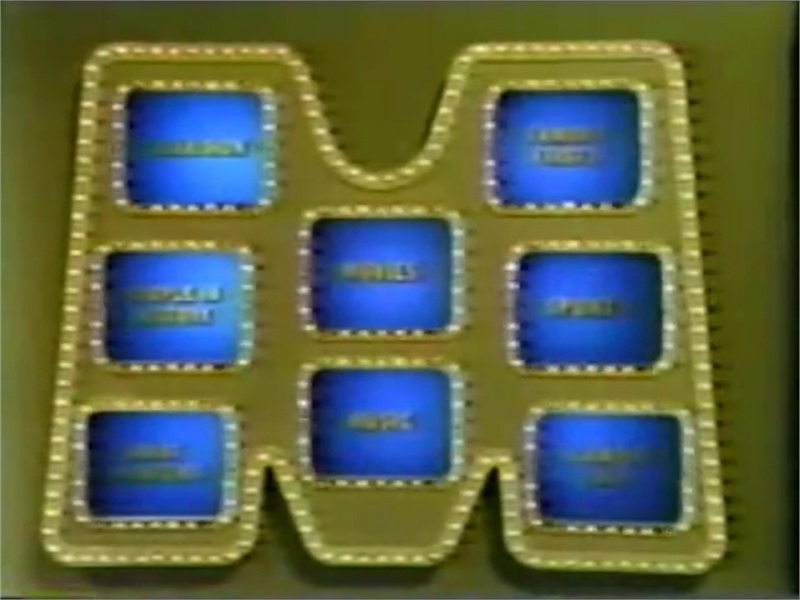 In the main game, Trebek will ask a panel of three contestants a question with a two-word answer. Two of the contestants buzz in when they know the answer, and each give a word based on the order they buzzed in. For example, if the question were “Who is the host of Malcolm,” Alice and Bob would both buzz in, leaving Charlie out in the cold. Alice would say “Alex,” and Bob “Trebek.” They’d both get 10 points. But if Alice said “Alex” and Bob said “Hamilton,” both Alice and Bob would lose out, and then Charlie and Malcolm would have to answer another question — with Malcolm always going first to give an extra hint. The round was over when a contestant hit 50 points. There’s also not much incentive to screw over another contestant — even if you lose, if you happen to the contestant who helps the winner get 50 points, you come back for the next game. (Not that there was a next game.) 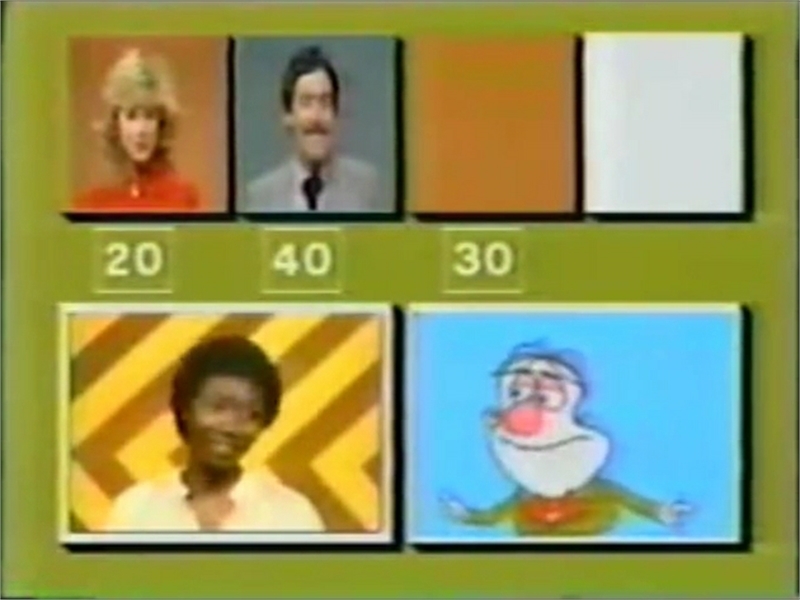 The winner goes on to a bonus round, where they choose categories from a big “M” and are asked similar questions with Malcolm, again, giving the first word of the answer. But, of course, the draw of Malcolm, such as it was was Malcolm himself. Malcolm was an animated puppet on a TV screen, played by Bob Stone. He was what’s known as an “Aniform” puppet — which, truthfully wasn’t “animated” in the way we think of it. Aniforms were created by Morey Bunin, and the first Aniform puppet appeared on Captain Kangaroo. Another Aniform puppet hosted his own New York City kids’ show, Barney’s Army. Though people might think of modern day digital puppets like Waldo from Black Mirror‘s “The Waldo Moment,” Aniforms weren’t actually animated. The Barney’s Army fan site linked above goes into more detail, but the short version: Aniforms were actual puppets created out of foam rubber with a rod system to control it. They would then be videotaped with a special camera that could process the image, changing the colors and contrasts to make the controls invisible and flattening out the image to make it look like an actual cartoon. (If you’re really curious, you can check out Bunin’s original patent.) Though Malcolm was made in 1983, the technology was created in 1960. The Aniforms system was innovative in that it created an animated character — or, rather, a character that looked like a cartoon — but could respond in real time to what’s happening on stage. The puppetry itself is admittedly kind of basic; Malcolm doesn’t do much other than bob and sway around, but having a “cartoon” there that people can interact with gives it a little bit of liveliness. While Malcolm wasn’t picked up and was likely for daytime broadcast, I think the show could have had a shot if it’d been retooled as a children’s game show. I think the kids would have responded to the puppet much more, and the magic-trick element would draw in underage viewers. Not just that, but only airing on Saturday Mornings would have kept the gimmick from going stale. It’s understandable why NBC didn’t pick up the show, but, honestly, Malcolm deserved more than just a long lost pilot forgotten until someone happened to purchase a tape off eBay. Kittysneezes is supported by readers like you. If you enjoy what you’ve read here, please consider supporting us on Patreon or on Ko-Fi.